Without exaggeration, the Flinders Ranges boasts some of the most spectacular landscapes in Australia, encompassing rugged mountain ranges, expansive plains and impressive gorges. Overflowing with trails to walk, four-wheel drive tracks to explore and stunning vistas to take your breath away, it’s wise to take your time and make the Flinders Ranges an extended trip. The Ikara-Flinders Ranges National Park is the gateway to this stunning pocket of South Australia. Located about 450 kilometres north of Adelaide, the national park covers approximately 95,000 hectares. Wilpena Pound is the star attraction of the Flinders Ranges and is a must-see for any visitor travelling through this beautiful region. This natural amphitheatre, which covers nearly 8000 hectares, was created from a mountain range that has eroded over millions of years. A long, flat plain – the remnant of the valley floor – is full of scrub and trees, and is criss-crossed with magical bushwalks. One of the best ways to experience the vast beauty of this region is to hit the road and go four-wheel driving through the rugged landscape. 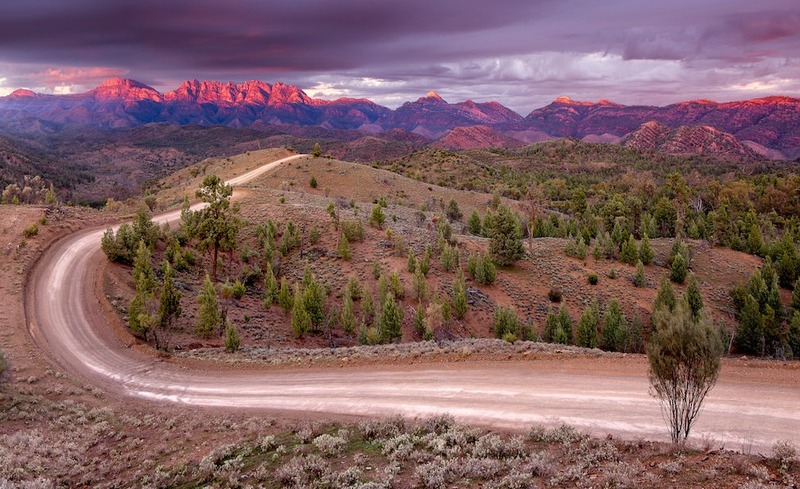 The sheer size of the Ikara-Flinders Ranges National Park makes driving a necessity, so make sure that you and your vehicle are well prepared. Some of the best routes include the four-hour Arkaroola Echo Camp Backtrack, which takes you through a rocky, twisting track then along the Arkaroola Creek to the magnificent Bararrana Gorge. While you’re in the Ikara-Flinders Ranges National Park area, take the opportunity to drive north and experience the magic of Kati-Thanda–Lake Eyre. A trip to this enigmatic salt lake will contrast sharply to the rugged peaks of the Flinders and will provide you with an alternative South Australian outback experience. After the rains from the tropical north flow into the lake, it turns from a dry salt plain to a never-ending sheet of shimmering water, attracting abundant birdlife into the creeks and tributaries.